She is currently a managing principal at Texas based investment firm Seventh Capital and offers 16 years of hands on experience managing capital and running consumer businesses. Monica also has written finance columns for WSJ, Bloomberg BusinessWeek, INC Magazine and Entrepreneur Magazine. Monica appears on Real Time with Bill Maher, O’Reilly Factor, The Adam Carolla Show, CNN, CNBC, Fox News Cavuto, Fox & Friends, Fox Business, MSNBC, Bloomberg TV and ABC News. Her advice has been covered by Forbes, The New York Times, Yahoo Finance and recommended by The Small Business Administration. She is a Operation Hope Project 5117 Ambassador, empowering economic mobility by teaching five million at-risk kids financial literacy basics and providing one million middle and high school students entrepreneurship training. Monica’s first book The Entrepreneurial Instinct: How Everyone Has the Innate Ability to Start a Successful Small Business (McGraw-Hill | 2012) explores the role of behavior and brain science in our ability to take entrepreneurial risks, be adaptable and bounce back after failure. The book received praise from the CEO Mastercard, former CEO Comp USA, former CEO Borders Books, The Wharton School, Dartmouth Tuck, a Fed economist, INC Magazine, BloombergTV, among others and was awarded Best Start-up Book of 2012 by Small Business Trends, Finalist for Best Book of 2012 in Business & Economics by Foreword Reviews and Best Book of 2012 by the National Federation of Independent Businesses. Prior to her career as a principal investor, Monica worked closely with start up businesses as a portfolio manager at a seed-stage fund backed by the Texas Pacific Group, managed a $150MM cosmetics business unit for L’Oreal and advised Fortune 1000 companies, including Bank of America and Nordstrom, as a strategy consultant for Marakon Associates. Throughout her career, Monica has assisted hundreds of entrepreneurs on a pro-bono basis to write business plans and secure loans through her work with the NY Business Solutions Center and the Wharton Small Business Development Center.She is a graduate of the Wharton School of the University of Pennsylvania. Monica’s passion for entrepreneurship is linked closely to her personal experiences as the daughter of a merchant marine ship’s captain and an artist, who faced a lack of opportunities and decided to forge their own way by starting a business. 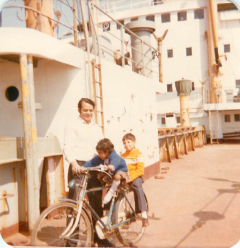 She spent her early childhood on a ship sailing through Asia; that’s Monica below, learning to ride a bike at sea. She spent her formative years in Texas learning to square dance. In college, she sang a cappella with John Legend before he was a big deal. Today, she’s a certified chef that watches way too much Bravo and gets a rise from watching partisans call the independent line on C-Span.